From the Podium – My Perspective on AIIM and ARMA Canada Conferences | PHIGs IMC Inc.
On June 10th I presented, for the third time, at the ARMA Canada regional conference. 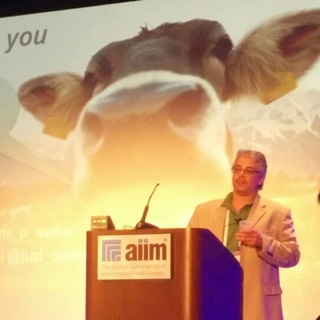 Earlier this year, in April, I presented for the first time at AIIM’s annual conference. The experiences were both positive, but very different. This post isn’t really about those experiences; it’s about a comment I received on the evaluation forms from my ARMA Canada session. The comment was that I was “preaching to the choir”. Uhm, yeah, I was. The topic of my session wasn’t related to the “why” of information governance, it was about a variant of how to do it. I’d fully expect that the session would be attended by people that already understood why information governance is necessary. That said, I fully agree with the sentiment. Pick a conference you’re fond of attending, go back over the last few years’ agendas and pick out what’s really fresh/new/exciting year after year. Not much, really. Even at a single conference you can see tons of repetition, albeit using different PowerPoint templates. So, what are we going to do about it? My guess is not very much, but here’s a few suggestions anyways. Presenters need to give themselves a kick in the hindquarters to get out of their comfort zones. I’ve got my topic for this year, but I will go on to something different next year, or I won’t bother to submit a proposal. Here’s a thought … try something new that doesn’t just address the latest SharePoint release or, if you’re a vendor, the latest version of your product (new branding doesn’t count). Attendees, you need to get active in conference planning and let the organizers know what you want to hear and see. I know that some of you are there primarily for the networking opportunities and vendor swag, but the sessions can be pretty useful too. In order to make them useful you need to jump in and provide direction. Here’s a little secret … YOU’RE PAYING THE FRICKIN’ FEES YOU ARE THE FRICKIN’ CUSTOMER!!! Conference organizers need to do a better job of screening and selecting content. Before you slit my throat, I do appreciate that your lot isn’t easy, and you really do a pretty terrific job. I do realize that it’s not easy to get people and organizations to show up and speak for however long you need them to. But, I’d rather see a two day conference with stellar content, than three days that includes some pretty mediocre content. If you’ve got one session that addresses “the state of IM in 2020 and beyond”, you really have more than enough. As for getting people not in the choir to attend … I don’t know. But I would start with making sure the content to be presented is appealing to them. When was the last time you heard a CMO say “I am so gonna attend that session on managing documented images as records in SharePoint 2013!”? I’d love to see more attendance from IM beneficiaries instead of practitioners. To those in the audience being critical – if you do it the right way, I appreciate it because it makes me better the next time. My contact info is included on every slide deck I use; call or email me to offer criticisms and suggestions. I received some criticism after my AIIM presentation and used it to make my ARMA Canada session, I hope, better. As long as you’re not just being mean I’ll use the input to improve. Lastly, to those of you sitting in the choir and not singing, get up on stage and join us. I’m certain you’ve got stories, wisdom, and experience that we could all benefit from. The experience is always rewarding, whether it’s by making new connections, learning something, or seeing that “aha” look on someone’s face. It’s hard work and can be nerve-wracking, but it is so worth it. Agree with you wholeheartedly, new content and new participants at these conferences would be a huge boon. I would also add for the conference goers to take advantage of the networking opportunities and speaker follow up offers at these events, especially for the IG folks who may be more naturally introverted, since it requires effort for us. Hear, hear, Sir. You have spoken a bundle. I confess that I have not been to a conference that really taught me anything new, As you said,,,”same material/concept – different slidedecks”. Chris makes an excellent point, conferences are great for the networking/idea sharing opportunity that they provide. But to fork out $$$ (or €€€) for just this is a bit steep. Chris, this is something I think about constantly, whether as someone who speaks at events thirty or more times a year, or as an organizer and producer of such events. I absolutely hate sitting in an audience listening to people talk, so that is the attitude I bring as a speaker and always try to do something real, useful, different, professional. However, here is the real issue. For the most part, the sponsors – and by extension conference organizers – have pretty low expectations around the content – the content titles and abstracts just needs to check the right boxes to attract attendees and enable them to justify the cost of attendance (or the cost of a boondoggle to a sunny resort destination). Also, once a conference achieves a certain level of success, they exert an inherently extortative influence on sponsors, who begin to feel like the cost of not being present would be higher than the cost of sponsoring, regardless of the quality of the conference, its attendees, or the content. I don’t mean to be cynical, nor necessarily tar all conference with the same brush. We just need to acknowledge the business model and its effects on the quality of the content. This is not to say it is not possible to have great content at a sponsor-funded conference. Newspapers and magazines function on the same model and of course some manage to produce incredible content. However, I am for more transparency around the business model. I, for example, would rather give sponsors an opportunity to talk about their products and services directly, rather than pretend that the business model is something other than what it is. Learning about products and services IS useful, given that we cannot solve IG without such products and services. It just needs to be delivered in an honest way – not as a supposed “customer case study” that is a hidden commercial for a product. Attendees get justifiable mad about the trick inherent in such presentations. They are a waste of everyone’s precious time. Also there are interesting models like finovate.com, which I have not attended and cannot speak personally, but a banking client is going and it appears to be an event with an explicit purpose of introducing attendees to new technologies. Anyway, keep fighting the good fight Chris! Excellent commentary and insight, Barclay. Thanks. You’ve hit the nail on the head in terms of the reality of conference production, while my PoV is more about what I think they should be. The reality is that conference attendees are to organizers and sponsors, what users and subscribers are to Facebook and Google. I think that we (the industry) can collaborate to make the conference experience better for all involved; you’ve certainly touched on a couple of things that can be done to move things along. As for being cynical, as long as it’s done in measured doses and with the right intent, it’s a good thing. It helps move us forward. Hummm….I am going to attend the ARMA Conference in San Diego this October. Hopefully it goes well! I’m an archivist with a CDIM who is now studying to become a CRM. Have fun. I haven’t yet decided if I’m going or not, but my speaking proposal was declined. That won’t really factor into my decision, other than as an additional cost for me. I’m fairly certain you’ll have a good time and learn a bit. Lots of really fun, smart people will be there. Probably some pretty decent sessions as well.